How a group for libertarian law students founded in 1982 has come to dominate the judicial nomination process. 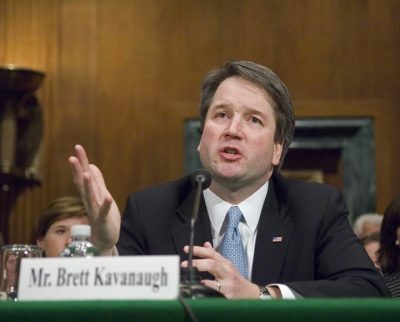 With Brett Kavanaugh confirmed as Supreme Court Justice, it means that five of the nine Supreme Court justices are members of the Federalist Society, a network of right-wing conservative lawyers that has become one of the most powerful groups in America today. The most enduring legacy of the Trump administration may be its remaking of the courts: in addition to two Supreme Court appointees (Trump’s other pick, the conservative Neil Gorsuch was appointed last January), Trump inherited 107 other judicial vacancies. According to New York Times figures, President Ronald Reagan inherited 35 unfilled judgeships and President Barack Obama had 54. Trump has effectively outsourced the task of filling these seats to the Federalist Society, and in particular to its executive vice-president, an ultra-conservative, devout Catholic named Leonard Leo, who has helped transform the lawyers network into, as the New Yorker describes it, a “conservative pipeline to the Supreme Court”. So how did the Society, which began as a students’ group, become so powerful – and what does it stand for? The Federalist Society was started in 1982 by conservative law students at Yale and the University of Chicago who wanted to create a counterbalance to what they saw as the liberal orthodoxy of law faculties around the country. Its first faculty advisers were Robert H. Bork at Yale (who was a Reagan nominee to the Supreme Court but who was rejected by the Senate) and Antonin Scalia (who served on the Supreme Court from 1986-2016, having been appointed by Reagan). The organisation rapidly spread to campuses across the country, spurred by funding from wealthy conservative donors such as the Koch brothers, and later sprung professional chapters too. Today the Federalist Society has 70,000 members and a presence on almost every university campus and in every major city. It organises regular talks and events for law students and practicing lawyers, which provide an opportunity for conservative lawyers to network and build reputations. That the Federalist Society has such an active student and professional body makes it different from many other interest groups, which tend to be dominated by Washington staff, says Steven Teles, the author of Rise of the Conservative Legal Movement: The Battle for Control of the Law. It means that Leo has a very “dense intelligence network”, Teles told me when we spoke on the phone. As well as building links between conservative lawyers, the Federalist Society’s talks and events have provided a way for it to spread and develop its ideas and approach to judicial philosophy. The Society grew up with its first student members, as they began taking up senior jobs in government and the judiciary, providing the Federalist Society with a network of like-minded lawyers that extends right up to the Supreme Court and the President (the White House lawyer Don McGahn is a member of the Federalist Society) and across campuses, companies and local courts around the country. As well as being well-organised and well-funded, the Federalist Society’s ideological purity makes it a formidable political force, Teles argues. Its members are united by their judicial philosophy rather than any partisan affiliation to the Republican Party. On its website it describes these principles as “that the state exists to preserve freedom, that the separation of governmental powers is central to our Constitution, and that it is emphatically the province and duty of the judiciary to say what the law is, not what it should be”, which entails “reordering priorities within the legal system to place a premium on individual liberty, traditional values, and the rule of law”. As this abstract wording suggests, the range of opinions held by members of the Federalist Society is quite broad though they share a similar approach to the law. The main tension within the group is between those who believe their primary function should be constraining the federal judiciary and those who believe their role is to empower the federal judiciary to enforce what they see as America’s founding principles, Teles says. “In general they promote these kinds of ideas: they are in favour of small government as opposed to big government, they oppose most government regulation of business and property, their core value is private property and the ability of a private property owner to do what he or she wants with their private property, they are strong believers in American exceptionalism and believe the US has a special role to play in the world and that people in the US are somehow a special kind of people, they would rather have things done by the state than federal government and they are strong on religious freedom but religious freedom of a sometimes extreme nature – arguing, for example, that religion is an excuse for not complying with anti-discrimination laws,” says Michael Avery, the co-author with Danielle McLaughlin of the book, The Federalist Society: How Conservatives Took the Law Back from Liberals. The Federalist Society’s influence rose with the presidency of George W Bush – all the federal judges that were appointed by Bush were either members of the Federalist Society or were approved by the group – but it has never been more powerful than it is today. Not only does the large number of judicial vacancies present them with an unprecedented opportunity to remake the courts, but Trump has also given Leo more power than any previous president over judicial nominations. At the Trump administration’s request, Leo drew up a list of 25 potential Supreme Court nominees for the president’s consideration, which included Kavanaugh. At the same time, the influence exerted by the Senate on the nomination process has decreased. This may be, as Avery suggests, because Trump is “lazy” and by outsourcing his work to the Federalist Society he can be sure they will put forward people who appeal to the president’s conservative base. Or it may be, as Teles suggests, that Trump realises that such a transactional relationship is his best way of keeping social conservatives on his side. One of the most effective checks on Trump has been the US courts, who have challenged some of the administration’s most egregious policies, from the Muslim ban, to child separations, the rescindment of DACA and environmental deregulation. In addition to the threat to women’s reproductive rights and LGBT rights, a judicial system dominated by right-wing libertarians might have responded very differently to Trump’s executive orders. “It’s important for all Americans to understand that the extreme right wing, the extreme conservatives, are much better organised, much better financed, and have a much better idea of what they’re about than the liberals or progressives do. The liberals or progressives need to wake up and take a look at what’s happening at the other end of the ideological spectrum and figure out a way to get their own house in order, because liberals and progressives have been losing ground now for the last almost 40 years, and even to this day they have not come with either an effective set of ideas or an effective organising principle that allows them to make this a fair contest,” Avery tells me. In the absence of an effective liberal alternative to the Federalist Society, the best hope for liberals is that they will win back control of Congress at the Midterms, he says.